Did Combetta actually schedule to appear there? Or was he served a subpoena by U.S. Marshalls and, therefore, won't be showing up? Even if he shows, I imagine he will plead the 5th. Cheryl Mills and the BlackIvy Group and BlackRock.....worth exploring? I'm wondering if one of the "very V-I-P" email address Combetta was trying to strip out...was Obama's pseudonym? Fear of Hillary is one thing...fear of Obama, quite another. Am I alone in thinking the timing of this revelation that THREE other people have some 'partial' immunity was strategic? CNN and Politico have been ignoring this Reddit story. And it's safe to assume that the Clinton camp told them to hold off until they had a response. We know they coordinate with Politico and CNN, like that, from the DNC wikileaks. The 'partial' immunities go all the way up the chain (except Hillary) -- so they can all take the blame, in the public's mind, that some or all of them ordered Combetta to tamper with a VIP's email address. And none of them will talk if subpoenaed by Congress -- they'll all plead the 5th because their immunity is only 'partial.' And yet, they have enough immunity to never be prosecuted. Now, it's probably going to be impossible to get to the bottom of the Reddit post and who 'they' actually are who wanted a VIP's email address stripped. THAT^ is the Clinton's response to the public about this the Reddit story. The timing and how CNN & Politico handled these two stories is completely suspicious. In examining a few things about Cheryl Mills, I have come to the conclusion that this entire bunch are operating under the code of Omerta. Our Congressmen are doing the best they can, but when your top government investigator, the FBI Director and the AG of the U.S. are part of that cover-up, what can they do? This opinion article will make you see the extent of it, the negligence, the cover-up, the sloppiness of this investigation, and, if you are like me, you will be sickened to see how they tied the hands of the Oversight committee dedicated to helping the American people find truth and justice. Pay particular attention to the information regarding Cheryl Mills. This isn't the first time she has hidden documents for the Clintons. My only conclusion is that the entire bunch, including those charged with investigating the corruption, are in on it or the Clintons with the help of Cheryl Mills (I've always said she is a Big Fish in all this graft) have totally and completely outsmarted James Comey. My respect for the FBI has really been diminished. Quite the nice little package they've got isn't it? Anyone who could have fingered Hillary is not saying anything for fear of breaking their immunity deal. Congressional subpoenas are ignored, it's learned that the POTUS had a secret email account he communicated with Hillary while she was Secretary of State on her personally owned server, and despite the clear timing of the posts stonetear (Paul Combetta) made and what can be determined from the content of those posts, the FBI found that there was no intent behind the mishandling of classified information and does not seem to have pursued an obstruction track in their investigation. I am at a loss as to how Hillary has any support at all. Maybe it's because everyone realizes the world is run by crooks and we might as well have the crookedest one in charge? 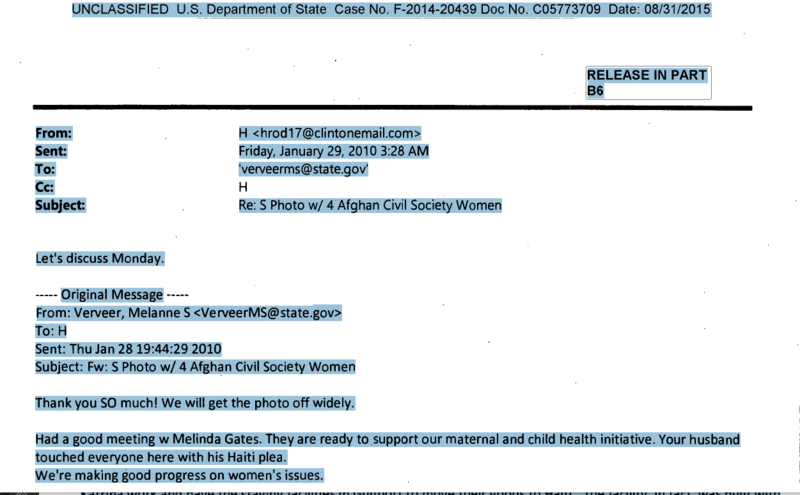 I’m still considering the idea that Hillary was using a second email address. Here’s the scenario I am considering: Hillary had a second email address and it had to be stripped out of her hdr22 archive because she knew she had CC’d some messages to her ‘other’ account from her hdr22 email address. The instances were few, but, none-the-less, they had to be found and stripped out. Keep in mind…the archive includes emails TO AND FROM Hillary. On March 16, 2016 WikiLeaks launched a searchable archive for 30,322 emails & email attachments sent to and from Hillary Clinton's private email server while she was Secretary of State. And if you open the original pdfs of the messagges, you’ll see the CC address simply shows ‘H’ — the name of her account — but no email address appears next to it. Anyway, why would this be something to protect at all costs? Because Hillary went on record, more than once, telling Congress she only used one account. And she could not wriggle out of that lie by saying she thought she was telling the truth, at the time, and didn’t intend to lie. …anyway, just a thought path I was following.